My next installment of the YA Recommendations Series is for readers who like reading historical fiction or history books. Karla is joining me again for this post! 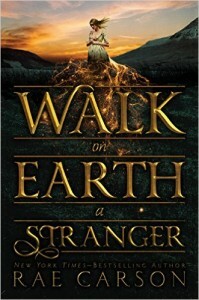 Walk on Earth a Stranger by Rae Carson – Set during the Gold Rush, this is the story of Lee Westfall, a girl who can physically sense gold in the world around her. After the tragic death of her parents, Lee dresses as a boy and takes off, joining a caravan heading west to find gold. This book is really solid historical fiction, with details about caravan life, encounters with Native Americans, and social expectations for men and women in the 1850s. I enjoyed watching Lee deal with both external and internal conflicts. Out of the Dust by Karen Hesse – This one might be a little more middle grade than YA, but I recently read it with my 10 year old daughter (as her bedtime reading book), and we both loved it. The story is set in the dust bowl of Oklahoma during The Great Depression. The main character, 14-year-old Billie Jo, has to face a mountain of conflicts: an accident that damages her pianist hands, an unexpected death, a distant father, and the interminable dust storms that kill the crops. Despite her difficult circumstances, Billie Jo survives and eventually thrives. This book is written in verse, which might throw some people off, but it easily reads as a narrative. 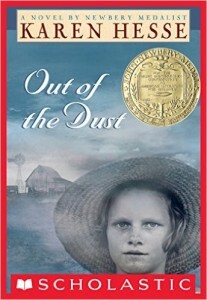 Out of the Dust won the 1998 Newbery Medal. Historical fiction is not my area of expertise by any stretch of the imagination. I have not read that much of it in YA or in adult fiction to be honest. However, I will say that of what I have read I have always preferred those in the YA section. I feel like YA writers go out of their way to make historical stories more approachable to readers. Here are some that particularly have reached me. 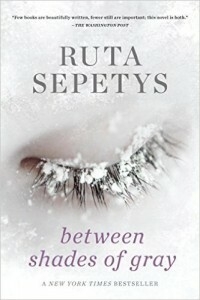 Between Shades of Gray by Ruta Sepetys – This is the story of 15 year old Lina and her family, who are pulled out of their Lithuanian home by Soviet guards and end up in Siberia. It is a heart wrenching story about a side of World War II that we don’t often hear. The author says she determined to make the book fiction so that it would be easier on those that she spoke with to tell their stories, however it is very much based on their historical and true accounts of what happened to them. I defy anyone who reads this book to do so without ending in tears at some point! 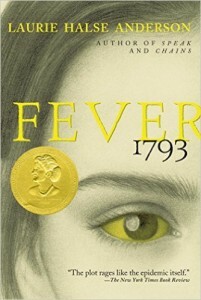 Fever 1793 by Laurie Halse Anderson – The Yellow Fever of 1793 is not something I knew much about at all before reading this, but the book brings it to life in an amazing and simple way – by connecting the reader to characters living it. Mattie Cook is a regular teenager faced with extraordinary challenges. The author does an amazing job of focusing those post-war and specific historical trials in such a way that they can be understood today. The horror of neighbors turning on neighbors and fearing one another is something we can understand in today’s world and this book shows us it is not a new phenomenon. 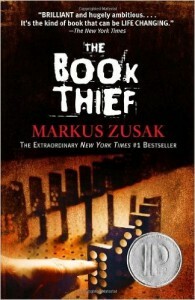 The Book Thief by Markus Zusak – Because I spent a good deal of my childhood in Germany I am both drawn to and very affected by stories of Nazi horrors. 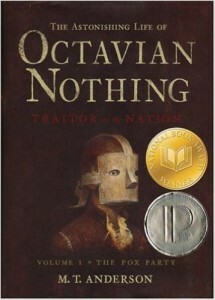 This book was a very unique take on the story we all know. It is narrated by the character of death itself, who obviously has a lot to say during the holocaust. The other main character lives in a German family that chooses to help Jews and thus puts itself in danger. Amidst all of this, she is growing up and discovering who she is. The book also puts a high priority and focus on the written word. Obviously as a librarian and self-proclaimed book geek, I love this! This was a hard read for me in many ways. As I said, stories about World War II and particularly Nazi terrors have always affected me greatly, and this one certainly did, but there is great beauty in this book and I believe it should be read.